I’m thrilled to release this poster created for the mighty Bleacher Report celebrating the 40th birthday of that famous footballer, David Beckham. I was one of 10 artists asked by Bleacher to contribute an illustration for their lovely Art of David Beckham online installation. Despite my being horridly overworked this last while, I couldn’t turn down this opportunity. 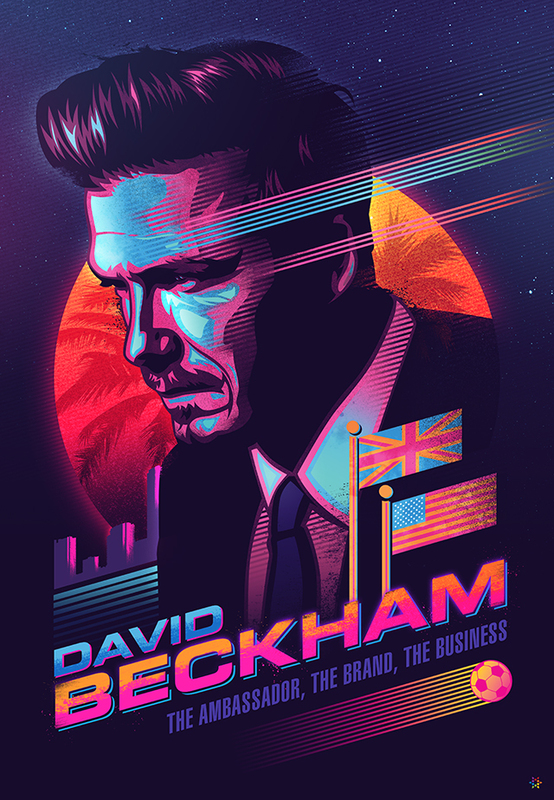 The awesome team at Bleacher Report wanted me combine the styles of my 2 DRIVE posters into one illustration, pushing Beckham into a ‘James Bond’ icon with a distinct Miami vibe. I’ve been using this colour palette for months now, so this was a perfect match to my current workflow. Be sure to check out all the rad Beckham pieces at Art of David Beckham, and a big thanks to Ishaan, Will and the team at Bleacher Report for the opportunity. I find it very interesting the use of colors in this poster, a touch of seriousness reflected in the illustrations of David. Evidenced the influence of Milton Glaser in the artist, throwing a resemblance to the colors used in the poster of Bob Dylan. Imbues a touch of the night in Miami Beach, more like a James Bond, as reported by the creator of the blog post, i Think this poster reflects the serious and funny style of Beckham. Amen! He just loves it! This is it!